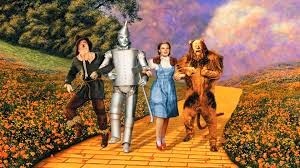 The Bridgewater Public Library is currently exhibiting a collection of items related to The Wizard of Oz, loaned by Gail McCarthy. This is the 75th anniversary of the film’s first showing. Gail works in the Reference Department at the West Bridgewater Public Library, and has been collecting Oz memorabilia for the past 40 years. The collection will be available for viewing through the end of June.